The Sustainability Management Student Association (SUMASA) is a student organization elected to represent the student body of the Columbia University Sustainability Management Master’s Program. We strive to advocate on behalf of the students, foster community engagement, and provide meaningful development through academic and networking opportunities in an evolving sustainability industry. SUMASA is bringing you local and responsibly grown foods delivered weekly! Do you prefer to eat local and responsibly grown foods? SUMASA has you covered! We are getting our location for locally grown foods! Community Supported Agriculture (CSA) gives you the opportunity to support local farms by pre-purchasing shares. Every week, a delivery location will be setup near Columbia’s campus for easy pick up. 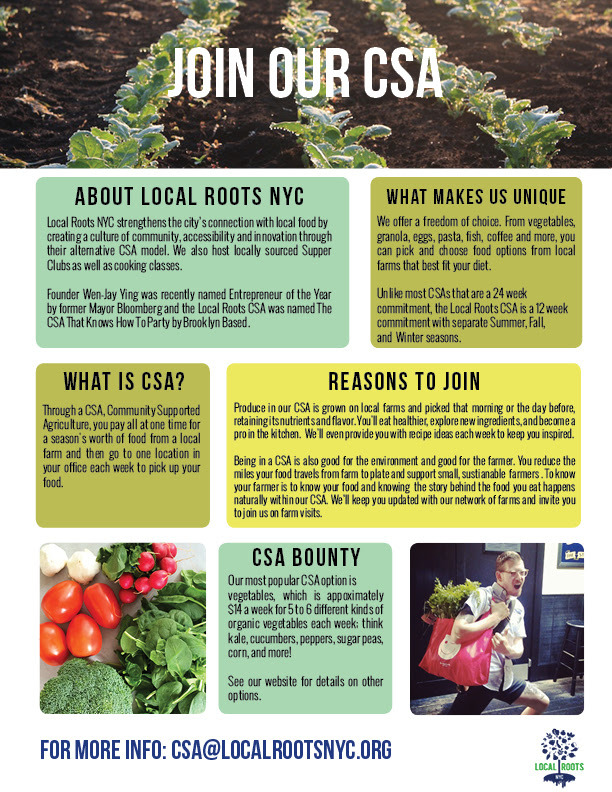 The CSA we are working with is Local Roots and you can find out all about the organization and the farms they support at http://localrootsnyc.org/our-csa/. Fall Season runs September 2 – November 18. We need to have confirmation that you would like to join the Columbia SUMA CSA by August 1, 2014. You can confirm your interest by emailing Karen Mahrous at km2946@columbia.edu. Please DO NOT sign up for the CSA yet online. We must first confirm we have enough participants to setup our location and then (and only then!) you will sign up online. A vegetable share for 1-2 people for all 12 weeks starts at $168! It’s a great deal. More information on pricing and all the amazing products that you can pick up on a weekly basis can be found here. Please note, these prices are for a full 12 week share of each item. You select the items you want and you get those all fall! Below is a one sheeter with additional info. If you have questions or any interest, please reach out to Karen Mahrous at km2946@columbia.edu. Please join us for a special SUMASA Speaker Event on Monday, April 22nd. Vincent Stanley, Vice President of Marketing for Patagonia will speak about the company and a new book just published: The Responsible Company: What We’ve Learned from Patagonia’s First 40 Years. The book is co-authored by Patagonia founder Yvon Chouinard.